« Birth of the field of dreams!! New-look Wolves bounce into action!! 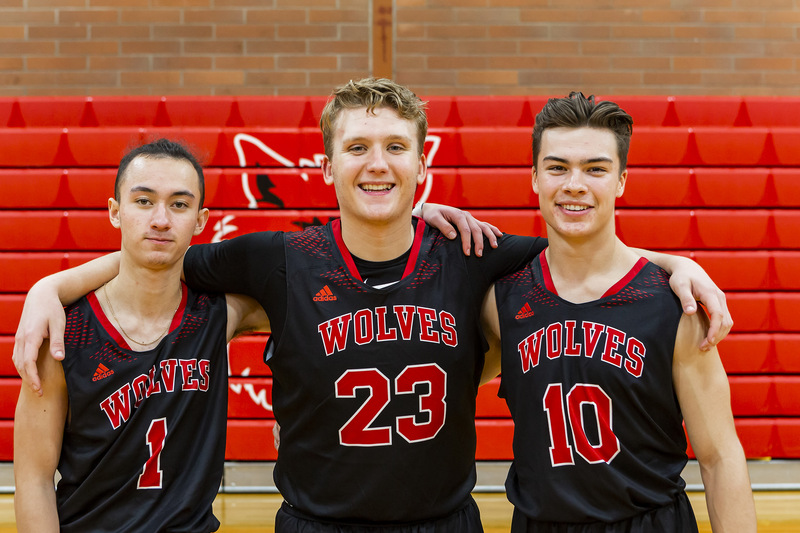 The Wolves are led by (l to r) junior Jered Brown, senior Dane Lucero and junior Sean Toomey-Stout. When the Coupeville High School boys basketball team steps on the court for its season opener, it will be a vastly different team from a season ago. The Wolves lost seven seniors to graduation, players who teamed to score 1,523 points during their varsity careers. Included in that group is Hunter Smith, who departed as the 12th highest scorer in the 101-year history of CHS boys hoops. But it’s a new day, and while Coupeville will miss Smith, Kyle Rockwell, Ethan Spark, Joey Lippo, Hunter Downes, Cameron Toomey-Stout and Ariah Bepler, the cupboard is far from bare. The Wolves return six players who saw varsity action during the 2017-2018 season, and get back the services of the school’s top male athlete, who missed basketball season last year while rehabbing from a football injury. That welcome addition is junior Sean Toomey-Stout, and after earning All-Conference honors at three positions during the gridiron season, “The Torpedo” is ready to lay waste to the hardwood. 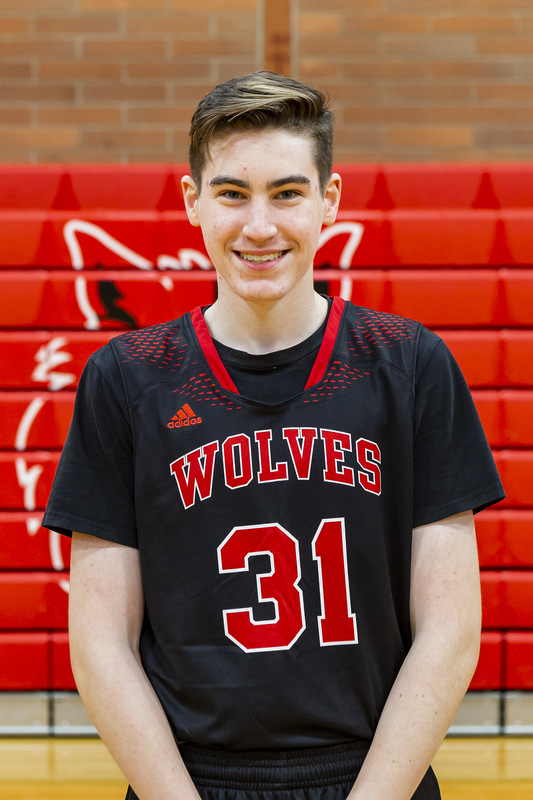 “It’s hard to match Sean’s work ethic (on and off the court) and we’re looking forward to seeing that on the floor this year,” said Coupeville coach Brad Sherman. Post player Dane Lucero, the team’s lone senior, and junior point guard Jered Brown form a potent trio with Toomey-Stout. Lucero and Brown are the only returning full-time varsity players from last season, and will be looked to as leaders. Juniors Gavin Knoblich, Ulrik Wells, Mason Grove and Jacobi Pilgrim, who swung between varsity and JV last year, make the jump to full-time A-team status this time around. Grove, who made a blistering run at the school’s unofficial JV basketball single-season scoring record, knocked down 51 points in limited varsity time as a sophomore. With the departure of the seniors, that leaves him as the top active career scorer for the Wolf boys program, topping Brown (29), Lucero (16), Knoblich (5), Wells (4) and Pilgrim (1). Wells, Knoblich and Pilgrim all are a year older, and a year stronger, and all hope to make an impact in the paint. “Ulrik is really developing in the post. He could have a big year,” Sherman said. “Gavin has had a great couple weeks of practice. Really working hard and getting the attention of the coaching staff. While that seven form the core, juniors Jean Lund-Olsen and Koa Davison and hot-shooting freshman Hawthorne Wolfe have also worked with the varsity and could end up in the mix. With a strong turnout, Coupeville will field three boys hoops squads this season. Seeing a rise in turnouts, especially coming from the younger classes, is key to the program building valuable depth at every rung. “Excited about the freshmen class coming up,” Sherman said. “Won’t name them all – it’s a big turnout, which is great. “Lots of athleticism, a few kids who would live in the gym if we let them,” he added. “Some are going to be impact players right away. They put in a lot of work this summer and jumped right into the program ready to go, and ready to work, which has been exciting to see as coaches. Sherman, still the #8 scorer in Wolf boys hoops history (874 points, if you’re wondering), enters his second season at the helm of the CHS program. He’s joined by returning JV coach Chris Smith, as well as new assistants Scott Fox and Patrick Upchurch. After going 7-13 in his first season, 5-4 in Olympic League play, Sherman will shepherd his players into a new league this winter. The new-look North Sound Conference pits Coupeville against former Cascade Conference foes Sultan, South Whidbey, Granite Falls, Cedar Park Christian and King’s. South Whidbey won the league title last year, but lost all-universe player Lewis Pope to graduation. King’s, which knocked the Falcons out of the playoffs, finished 6th at state. But again, today is a new day, something Sherman embraces. “Brand new league and a lot to learn about some of our new league opponents; we aren’t going to look past anybody,” he said. “There is certainly some very skilled competition and strong teams ahead of us this season. “I think we’re still learning a little about ourselves as a team so early in the year, but as a coaching staff we’ve seen a lot of things we really like,” Sherman said. “I love the effort from our guys so far and the desire to give an all-in effort every day and compete. More than anything, the Wolves want to exit every practice, every game, confident they have taken another step forward in building the program. “To get better every week. To develop leaders on and off the basketball court. To put our best effort forward every time we hit the floor,” Sherman said.